These truffles are rich, creamy smooth and just melt in your mouth! Literally, as I am writing this post, my mouth is watering! Classic vegan truffles are to die for! Valentine’s day is coming up, so truffles are a great safe option to make for that special someone or just for you! Truffles are great to make the day before as the flavor consistency tastes best when chilled overnight. As most of you know, a classic chocolate truffle includes a ganache that is composed of heavy cream and bittersweet chocolate. 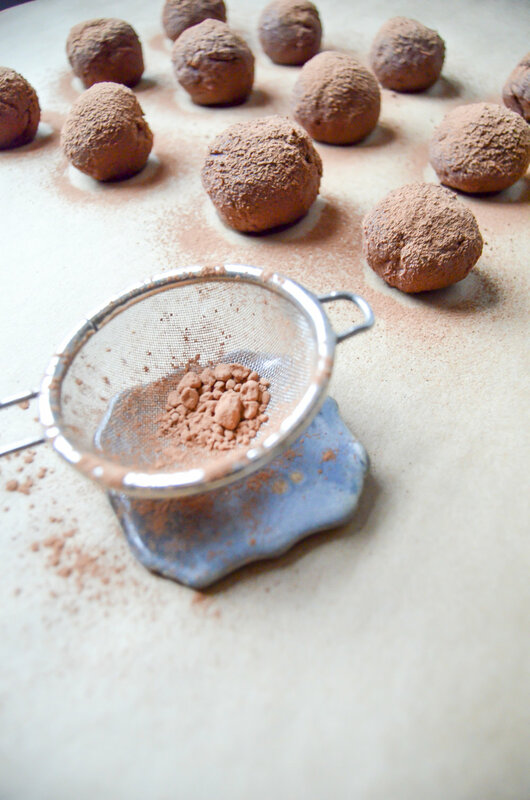 You can dip the truffles in chocolate or dust them off with cocoa powder. I am lactose intolerant, so I haven’t been able to eat a classic truffle in quite some time. Through countless recipe testings, I am finally at a point where I can eat a truffle and not be sick! While this recipe follows the traditional approach on making a classic truffle, the special ingredients that are orchestrated in these special little balls are what makes them stand out the most. Check out below on how to make these amazing bad boys! These classic vegan truffles are made with ingredients that are naturally lower in sugar while maintaining the classic creamy ganache texture! In a small saucepan, heat coconut cream, coffee, and pure maple syrup while whisking consistently. Just as it starts to boil, take the saucepan off the burner. Cut the chocolate bark into pieces (can use small chocolate chips too) and place into a medium bowl. Pour the cream mixture over the chocolate. With a spatula, fold the cream mixture with the chocolate until fully incorporated. Let the mixture sit until room temperature and place into fridge to chill for up to 2 hours. When the ganache is firm, use a small scooper or spoon and form the ganache into balls. Roll them in your favorite toppings like cocoa powder, coconut flakes, or melted chocolate with clean, cold hands. Store in refrigerator until ready to serve! Before setting your ganache mixture in the fridge to chill, cover the top layer with plastic wrap to prevent a skin from developing as well as to keep the ganache away from dirt and fridge odor. Best when chilled in the fridge overnight. If you are putting it in the freezer to speed up the "chilling process", set the ganache out until room temperature before scooping into balls. If you try to scoop when the ganache is really firm to frozen, then the ganache will fall apart and it will be hard to form balls. If you find the balls are melting in your hands as you are forming them, wash your hands and keep an ice packet or frozen bag of peas at bay to lower your hand's body temperature.